The Canada C2C trip is finished and we have all been going over our route maps, trip info, pictures, and trip statistics in order to prepare a trip overview. It has been fun looking back and preparing this overview. It makes me, for one, wish we were back out on a long ride into the wide blue yonder! Looking back also brings to mind of all the people who helped make this trip so wonderful. To all of our friends and family - thank you so much for hosting and supporting us throughout this trip. Our success is due to you! A special thank you to those who we met on the road. You took us in, put us up, fed us, made us feel like family, and got us back on our way. Or, maybe, we met and rode together for a little while, sharing campsites, conversations, and a lot of fun. Together you all showed us how big-hearted and generous Canadians are. It is people like you that do Canada proud and have us recommending this country as one of the premier bicycle touring destinations in the world! If you can't see the above map, click the View Larger Map link. It should open in a new window. Looking for more detail? Check out the links below. Quebec This map has more than one screen. Use the button at the lower left to move between pages. We took lots and lots of pictures along the way. Total mileage: 9178.7 km for Mark; approx. 9450 km for Mike and Mary. Longest day: 168km, from Ponteix to Weyburn, SK. Highest elevation: 1774m, at the top of Kootenay Pass (Salmo-Creston), BC. Highest camping spot: Blairmore, AB, just over the Crowsnest Pass, where the townsite (and campground) is at about 1350m - only a little lower than the pass itself, which is at 1396m. Three other spots came in at around 1200 metres -- the Cypress Hills in Saskatchewan, Coldspring Campground in BC's Manning Park, and the Waterton Reservoir in Alberta. We needed our sweaters for these spots! Highest single-day elevation gain: Hope (50m) up to Hope Slide (750m), down to 600m, and then up to Allison Pass (1352m) for a total day's climb of 700 + 750 = 1450m. Close to that is Christina Lake (450m) up and over Bonanza Pass (1535m), then down about 200m, and then back up over Nancy Greene Summit (1576m), for a total elevation gain of around 1100+250 = 1350m. The climb up Kootenay Pass is "only" Salmo (660m) up to 1774m for 1100m overall, but it accomplishes that in just over 20km, for a pretty steep average grade. The Cabot Trail, in Cape Breton Nova Scotia, also gave us a day of just under 1000m of elevation "gain". On July 28 we did Cheticamp to French Mountain (455m), then approx. 50 metres net gain (150 down, 100 up) to the summit of McKenzie Mountain. From here it is down to sea level at Pleasant Bay, then up 445 metres to the summit of North Mountain. Total elevation gain: approx. 950m. At between 10 and 12% for 4.5 kilometres, North Mountain was our steepest prolonged grade of the trip. Flats: 2 (Mark -- in addition to one tire failure); 5 (Mary); 28 (Mike). Other bike problems: Broken kickstand (Mark); shifter cable readjustment (Mark); one front rack broken (Mark); one broken rear rack (Mike); one collapsed rear wheel (Mike); three replaced chains (one each); one replaced rear cog set (Mike); broken handlebar bag rack (Mike); five spokes replaced (2 Mary, 3 Mike); replaced middle chain ring (Mike). Animal sightings: 5 bears in total - 1 in Manning Park, 1 outside of Princeton (Mike), 1 in Atikokan (Mark), 1 outside White River, 1 half way between Schreiber and Marathon (Mike). We also had a bear visit our camp in Wawa. 15 moose - 2 in Alberta; 4 around Atikokan (Mark), 2 around Atikokan (Mike and Mary), 1 in Cape Breton, 2 in NL (Mark), 4 in NL (M&M). We saw/smelled about the same number of dead moose in Ontario and NL. Coolest camp sites: In a teepee, at Haviland Bay on Lake Superior (Mark); in a prairie marsh at Cypress River Manitoba, at the municipal campground in Midway BC on the banks of the Kettle River, and at the Mary Ellen campground in Petit Rocher, NB (Mike and Mary). There are lots of other things that could be put in here -- like the worst roads (Ontario and Manitoba), the best party provinces (Atlantic Canada), the buggiest camp sites (Cape St. Mary's, NL for Mark, Quetico Provincial Park, ON for M&M), the most cycle-friendly province (Quebec, hands down), or the best pancakes (the recreated Acadian inn in Cheticamp, NS, and Dave's East Gate diner, East Gate of Manning Park, BC). All in all, it was a great trip through a country full of stunning landscapes and wonderful, warm, welcoming people. 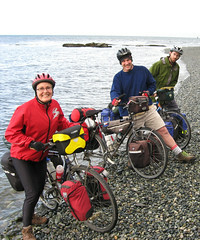 A ride across Canada is truly one of the world's great bicycle adventures. Highly recommended! If you are thinking about doing a trip like this, don't hesitate to get in touch -- you can reach us via the "About the team" link at the bottom of the page. 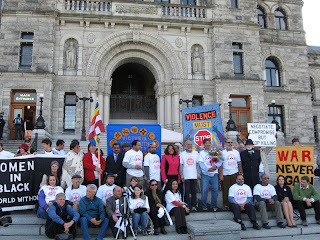 Monday Oct 27: remember the Multifaith Walk Against Violence we saw on the road in northern Ontario? (east of Sault St Marie, along the Missisagi River) Well, they finally got to Victoria yesterday; I went down to the Legislature and said hello - the imam remembered me and was very excited! They all took lots of pictures and we chatted briefly. Weird to think that I've been home for almost two months now and all that time Syed was still trudging along the highways. You can see him in the middle of the photo: his antiviolence t-shirt is noticeably more faded than everybody else's. They are organized by province and I believe the albums are arranged in reverse chronological order (the first, BC, is at the bottom). I thought about "geotagging" them - putting together a google map with the photos linked to their locations - but that is way too much work and for most of the photos it is described in the captions (or obvious, or irrelevant) where they are. If you really want to know exactly where a particular photo was taken, email me and let me know! Mary will have her photos online soon, she will have about 10 times as many as me, and they'll be better pictures, so enjoy those too (I often didn't take a photo of something Mary also had a photo of, so hopefully we didn't cover too much common ground). I put captions and cleaned them up a bit too, so if you saw them at the BBQ last night you have to go have another look! And finally, this is a selection of my photos, so if you (really) want to see all of them I can show them to you, but so as not to bore you too much I culled them for the web. We have finished a week in St. John's Newfoundland with our old friend Rod. We hiked a chunk of the East Coast Trail (from Bay Bulls to the Spout), went up Signal Hill, visited an archeology dig at Ferryland, the Ocean Science Centre on Conception Bay, and rode out to Cape Spear (furthest east you can get in Canada). Dinner theater, and a few nights out with friends filled our evenings. 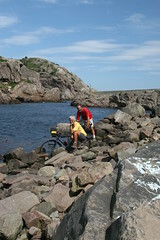 But, the thing that indicated the trip was complete with goals met was dipping the wheels of our bikes into the water in St. John's. But where to do it? We had already visited Mile 0, but it was quite a ways from the water, so no dipping there. The St. John's harbour is hard to get to, and, frankly, not the cleanest place in Canada (it will be a lot cleaner soon -- St. John's is getting sewage treatment). We selected the small harbour at Quidi Vidi, just to the north of St. John's proper. We had to cross private property to gain the Quidi Vidi water, and were invited to do so by the land owner. He then had us into his house to look at photos of others who used his harbour side to launch, finish, or carry on their adventures. Nice to know we are in good company. We'll be back home in Victoria tomorrow (Monday,Aug 25). Even now it is strange to think that the adventure is coming to an end -- what a great ride it has been! Frankly, I'd do it again in a heart beat. Hi all, just a quick note from sunny PEI. We've spent a few days in Charlottetown and then yesterday morning left on bikes; last night we camped along the dunes in PEI National Park at Stanhope and today we're in Cavendish checking out all the Anne/LM Montgomery sights! Tomorrow we'll stay at Kensington and visit a few more LMM sights (birthplace, wedding place) and then we're going to Sunnyside to see a musical before coming back to Charlottetown. I have booked my return flight (much as I would have liked to take it, the train just wouldn't work out well, and I got a super cheap flight) and I'm getting into Victoria a day before Cathy, I'll be there about noon on August 30th. Charlie is coming in at about 1pm that day, so we're planning on meeting up at the airport and riding into town together! So if anyone wants to ride back into town with me after four months away, just come on by the airport at noon next Saturday! (M+M) Aug 16 - 18: 9300 kms into St. John's -- We are FINISHED!! It seems almost surreal, but we are sitting here in the beautiful seaside city of St. John's NFLD with over 9300 kilometres under our bike wheels. It is strange to say this, but as of Monday, Aug 18 WE ARE FINISHED!!! We got a bit of a late start -- too much party time I think! Sonia fed us up and we loaded the bikes and headed out. The day was clear, sunny, and warm. It looked to be a perfect day for making some miles, but the late start and a headwind kept our mileage down. We had a hump out of Clarenville to get back on the Trans Canada Highway. We spent the rest of the morning riding around the southern end of Trinity Bay. We had some fine views of Trinity's capes and bays early on, especially around Ivany's Cove. Then it was up onto the spine of land that separates the Burin peninsula from the Avalon. At Come by Chance (one of those amazing Newfoundland place names) we could actually see Trinity Bay on the east, and Plancentia Bay on the west. This spine of land is home to some of the famous Newfoundland fogs. Certainly we got to experience them! We were riding along after lunch when the first wisps started to make themselves known. Within about 15 minutes we were enveloped in a cool, clammy blanket. We had to ride with some care as visibility in sections was quite limited. Fog seems to change the landscape and the scrubby black spruce, small ponds, moss, and lichen seemed almost alpine as they resolved out of the fog. The place reminded us both of being up in the sub-alpine of Strathcona Park on Vancouver Island. We decided to head down to the water and try camping at Bellevue Beach campground. Blue sky reappeared as we headed away down the Osprey Trail away from the TCH. As the name suggests, the site was beautifully situated above a sand beach on Trinity Bay in the Chance Cove area. We had beautiful views and the sound of the ocean in our ears all night long. The campground had some drinking water troubles, so our purification chemicals came in handy. Even though it was a beautiful and breezy afternoon, Mike set up the tarp. Lucky he did, the fog descended in the evening, and the rain started overnight. This campsite also had a fresh hatch of black flies -- those odious little creatures! Mike was especially bothered as he decided to take the stove apart. Doing detail work as the black flies eat you is something of an art. Mike did quite a bit of dancing around and yelling, but the stove did burn cleaner. On the upside, black flies do stop bothering you in the evening, and we had no mosquitoes to take their place, so the later evening was pretty much bug-free. We woke to rain, but the tarp allowed us to enjoy our breakfast and pack up in dry comfort. The rain was initially quite light and we had good views of Trinity Bay as we left Bellevue Beach. We got back on the Trans Canada into a headwind. About 15 km along we pulled off at the Whitburne exit for 2nd breakfast at the Esso. We were nice and wet and hungry by this time, with the rain pounding down, so the stop was appreciated. We toweled off, changed socks, and headed in to dry out. Our goal for today was well within reach -- the town of Brigus on Conception Bay. Mike's grandfather, Lemuel Roberts, was born in Brigus in 1849. Mike's mother has done some research on the family history in Newfoundland, so we where hoping to see some of the areas she has talked to us about. We got off the TCH on highway 71. It was a gravel road for a few kms, but it was quiet and we now had the wind at our backs. We rode into the small coastal town of Cupids after passing through Makinsons. Mike's family also has history here, so we visited the church and the ocean front. Founded in 1610, Cupids is the first English settlement in Canada. From Cupids it was south down the coast to Brigus. This little town, founded in 1612, has kept a lot of its character houses. It has a lovely waterfront walk, several old churches on high ground, and lots of Victorian, and older, era homes. We stayed at the Brittoner Bed and Breakfast. This 160 year old home has been beautifully renovated. It is right on the water and has views out across Conception Bay to Bell Island. Our host, Betty Barrett, made us at home. We dried out, did our laundry, and Betty gave us a fine tea and then dinner. As the afternoon closed the rain stopped and we got out for an evening walk around the town. Tomorrow would be our last day on the road -- St. John's is just a day's ride from Brigus and the weather report was calling for a sunny day. The tour is almost over for us! Mon Aug 18: Brigus to St. John's 88 km Betty gave us a fine breakfast and we headed out for our last day on the road. It was sunny and warm, but the wind was up. We had it in our face for the first half of the day as we made our way along highway 60 south around Conception Bay. The road was windy, with a number of hills -- but the views of the bay in bright sunshine were well worth the effort. Names like Marysvale, Avondale, Harbour Main, and Holyrood went spinning by. We even tried a few kilometres on the Trans Canada Trail outside of Holyrood, but it was a bad idea -- the trail is full of sharp rocks and is used by ATVs, so is in no shape for bikes. After Holyrood our route got busier and turned north. The wind was now at our side and not so fierce. We went up through Seal Cove (home of Jennifer Bursey Kent), and into CBS (Conception Bay South -- but CBS is how everyone refers to it). The road deteriorated here and the drivers got a bit wild, so we climbed the hump out of CBS and made our way back onto the TCH. We took this all the way in to our exit to Memorial University. We were planning on surprising our old friend and roommate Rod Byrne at work - he is a professor in the Computer Science Dept. We missed him at work, but got directions to his house and surprised him there, after a short diversion down into town. What a great fellow Rod is -- we arrived at his house out of the blue and are now staying with him. At dinner that night we also caught up with another old friend, Mike Rendell, and yet another Mike, Mike Rayment. We toddled around St. John's on our bikes -- down to the harbour (couldn't dip the wheels as it is only docks at harbourside), along some of the historic streets like Water, George, Gower, Cochrane and Bond. This seaside town is full of the most colourful old houses, and it seems like there are fine views down to the harbour from every street. But the streets are steep, and I had to push the bike up a few of them. And so did Mike - his drivetrain had finally had the biscuit and could not cope with the st. John's hills. It seems strange to consider it, but after over 100 days of riding and 9300 kilometres, WE ARE FINISHED!!!! We'll take the next few days to see the sights in St. John's and area -- things like Signal Hill, Cape Spear, Quidi Vidi, and some of the east coast trail. We'll spend some time catching up with Rod, and with new cycling friends Greg, Pat, and Brian (Pat and Brian were on the x-Canada road ahead of us).We will also ride over to visit the Kents on Bell Island. I'll post something more on our time in St. John's in the next few days, but for now we are simply revelling in our accomplishment and enjoying NOT loading up the bikes. Today was a nice morning that turned a bit rainy, but not too bad. I could have gotten to Halifax today but wanted to check out several museums and spots along the way and take a scenic route into town, so I arranged crash space in Head of Chezzetcook and took a leisurely day. I met a nice fellow named Nicholas cycling Quebec to Sydney via Halifax, so we were able to exchange tips about what each of us would see on the road. I stopped at the Heritage Village in Lake Charlotte and the Fisherman's Life Museum at Jeddore, which was very nice as they served lunch and tea (no extra charge) just as part of their regular daily routine to visitors. I also waited out rain a couple of times, and also visited the railway museum at Musquodoboit, which was interesting. In Head of Chezzetcook I stayed with Doug and Wendy and their parrot Elvis, and I had an excellent time thanks to their hospitality; and Doug is a local bike advocate so he told me about the rail trail into Dartmouth and various local bike issues. A very sunny day all day, which was nice. The rail trail into Dartmouth starts near Head of Chezzetcook and winds into Dartmouth via some very scenic areas; but the surface is not so great in a few spots (but otherwise very nice). I picked a ton of chanterelle mushrooms (probably $40 worth, judging by prices at the farmer's market in Halifax) along the way, stopped at Lawrencetown beaches to watch the surfers (and the surf), and immensely enjoyed the causeway across the salt marshes for several kilometres - a very scenic part of the trail indeed. I got into Dartmouth past Shearwater and the oil refinery and then proceeded into town to my hosts Sarah and Al, who kindly lent me crash space - and lo and behold next door was where Charlie was staying! So it was great to meet up with him again and trade stories. We had a big supper with Charlie, Reuben, Becca, Amy, and Joanna at Reuben's place next door and I made a big pot of chanterelle mushroom soup. Well, no more biking, at least until Cathy and I get to PEI: the bike is now luggage! Very weird to be reverting to "normal tourist" mode for a while (and just in time, judging by weather reports). Total mileage to date: 8930km . Probably fewer blog postings for the rest of the trip for me, as Cathy and I will be travelling and doing "normal" tourist things, so we'll keep our own record separate from the blog. Don't worry I'll post regarding the cycling on PEI! Check out our route -- we left May 7, 2008 from Victoria BC and finished in St. John's Newfoundland and Halifax NS in mid-August.